I am currently rehabbing a hamstring/glutes injury in my right leg. This moved from background pain to severe a couple of days after the Personal Best 5.0 race on August 9th. As a result I had to substantially cease my road training, switching instead to exercising, stretching and pool work. I had to skip the USATF 1.0 mile run in Flint on the 22nd of August and the 5K USATF-Indiana state championship on the 23rd. So much for my grand idea of competing in both--'pride cometh before a fall' they say and it may be true. Although it is too early in the rehab process to say for sure, but I hope to keep to the rest of the schedule posted below, at least the part starting October 5th in Syracuse. [Alternatively you can go to the 'Upcoming Races' at the tab above and then scroll down to the first entry underneath this one to view the schedule posted earlier.] 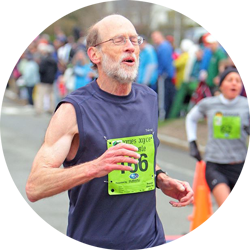 If I am running pain free by mid-September I will run a local race but it may not be the Jason Baker race--Stay tuned for updates.